All volume flow controllers available on the market analyse the pressure difference over a flow resistor – whether in the form of a differential pressure sensor or a diaphragm – in order to measure the volume flow. The lower limit to the accuracy of air velocity measurements in volume flow controllers is determined by the size of the measurable pressure signal. Since reliable regulation of small volume flows will be an important consideration for future building concepts, LTG has developed a measuring method that automatically improves measurement accuracy when measuring small air volumes in particular. Unlike in conventional measuring techniques, the differential pressure is not measured at an upstream component such as a diaphragm or differential pressure sensor. In the VRactive series of volume flow controls, the differential pressure is measured directly in the vicinity of the valve leaf. Although this is the area where the velocity field is subject to the greatest interference, it is also where the biggest measured signal can be obtained due to the local acceleration of the air flow. As a result, the volume flow can be determined with a high level of accuracy as a function of the valve angle and the pressure difference at the measuring element – recorded within a mathematical, multidimensional map. This system achieves the highest control precision of any known system used in the low air velocity range. 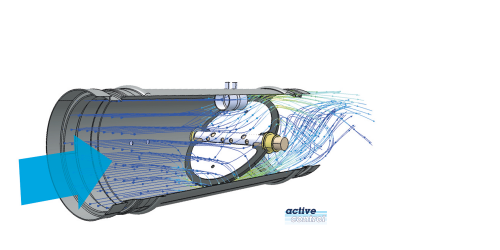 Since map-based control does away with the need to integrate a large obstructer element in order to increase the pressure signal (as in the case of a diaphragm), the VRactive controls have an extremely low pressure loss and further contribute to the energy efficiency of the air flow system. The LTG volume flow controllers are available with either a dynamic measurement process or a static measurement process (VRactive-s). Products using the ActiveControl system: VREactive, VRFactive and VRDactive.